Summer is all about flaunting the preppy prints and quirky patterns. As much as women enjoy styling their apparel for the warm sunny days, men also want to look and feel stylish for their part. There are many ways that men can look fashionable with their outfits with the easiest to style clothes without putting much effort. Be it chambray shirts or the slim fitting polo shirts, there are a flurry of ways that an outfit can be transformed to look cool. 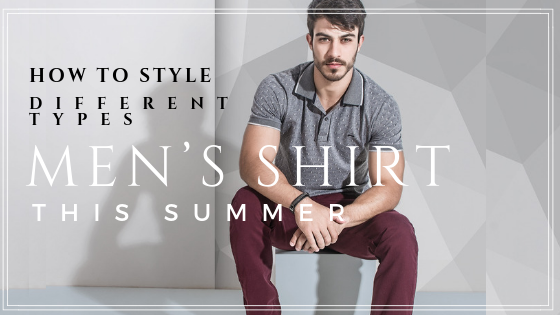 There is an assortment of men's shirt wholesale available in the market that can be invested on to create the chicest summer-oriented fashion wardrobe. Follow the couple of look books that are given in the blog to know more. Summer is the prime season for preppies to embrace color and pattern. If you're going to go for it, now is the time to opt for the look as chose those shirts with bold colorful patterns to make it look sophisticated and aesthetically pleasing. Any kind of bright plaid shirt would look good for this part which otherwise is kept at the back of the closet for the rest of the year. Retro floral print polo shirts have made a huge comeback! If you look back a few years ago, think about the shirts that your father used to wear for the beachy vacations. Well, those are the new cool this season and why not, if women can incorporate couch florals in their dresses then men can also opt for the vintage flowery vibes. Good quality polo shirts in vibrant shades are available with certified men's shirt manufacturers at affordable prices. Its hard to go wrong with a denim or chambray shirt this summer since it can be paired with any kind of bottoms effortlessly. Instead the shirt is quite versatile in nature, hence there is no specific limitation to how you can style this outfit. For e.g., you can either wear the shirt as it is, or you can wear a plain white tee underneath it and keep the buttons open for added texture and drama. Linen is the best among the rest of the shirts in the category. Given the fact that it is quite breathable, and easy on the skin it is a definitive choice among men for the hot and balmy summer season. These as much as makes for the ideal wear for the office, you can also style it for casual outings and dates. The most common of the men's shirt has got a lot of potential of creating stunning outfits that are highly appropriate for the summer. Retailers can get in touch with the best of the men's shirt manufacturer and let the team know of the required wholesale needs. What To Expect From A Quality Bulk Shirt Manufacturer?